Last week I received copies of this arts trail booklet I've been working on with The Museum Of Wigan Life. It's been one of those smooth little projects that flows nicely from sketch to final, and it's been a pleasure to work on. I absolutely love museums (learning's cool!). They're just so full of treasures, in both a literal sense as well as on a smaller personal scale - there's something about reading long lost love letters, or looking at dusty old photographs which can really spark the imagination. 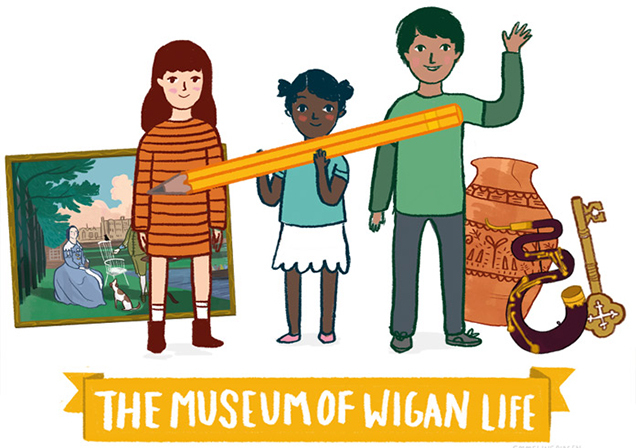 The brief was basically to illustrate a number of the objects on display at the Museum Of Wigan life, integrating them with characters and games as well as the essential information needed to record the child's progress whilst completing the art award. The booklets needed to be practical, but also have that 'to keep' element, so I worked with a bright colour palette and relatable child characters. It was great to get out and visit the museum for research (it's not all that often my commissions come with physical reference! ), and to work with Lynda from the museum and Kevin Lloyd as graphic designer. 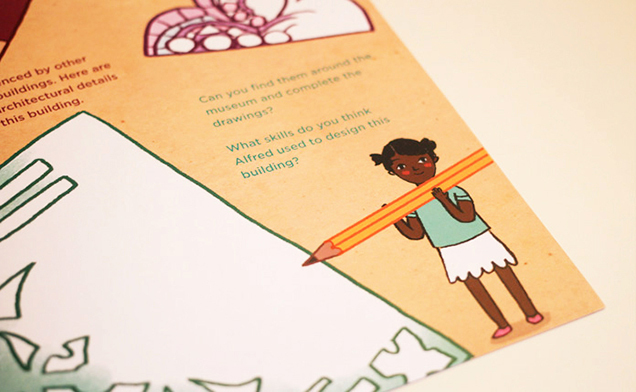 The booklet features games in which the children are encouraged to complete patterns of objects found around the museum and the building (designed by the same chap who designed the Natural History Museum, so you know it's interesting! ), as well as drawing tasks, a map of the museum, and an illustrated version of Edward Haytley's 'Sir Roger and Lady Bradshaigh in front of Haigh Hall' painting (which was a lot of fun to do!). The Museum Of Wigan Life is definitely worth a visit (in particular if you have kids thinking of taking part in the arts award!) and you can find out more about it here.